Probably one of the most serious problems this winter will be FROZEN UNDERGROUND WATER LINES. For many decades in northern areas water lines are buried 42″ or more to prevent freezing when the ground freezes solid. Water lines in the southern USA are not buried anywhere near that deep with some less than 12″ deep. Running water will not freeze, so people may need to keep a tap running slowly somewhere in the house, maybe for the entire winter. People will have to choose between a high water bill or no running water if the ground starts to freeze deep. An unmistakable bite of Arctic air is what the northeast and many places in the USA suffer with right now. Here in the northeast we experienced January temperatures a month early. There is a recognizable signature with Arctic air ­ bitter cold, wicked wind chills complete with just enough humidity to cut through your coat like a knife. Other than that it’s nice outside. I’ve been quietly watching local weather which has hovered around the teens in the northeast for the past few weeks. In December and early January, temperatures usually hover around the 20’s or even 30’s. But not this winter ­ it’s been much colder. So what’s happening across the United States? If the average annual temperature has been rising a few degrees according to global warming experts, will that explain temperatures more than TEN degrees colder than in the past? The logic behind warming must be truly unfathomable. Perhaps we need to use some of that “new math” which has intelligent college students believing 2 + 2 = 5. Of course, the warming science vehicle has already had the tires shot out from under it by hacker exposure. CNN recently posted an article about incredible cold happening everywhere. 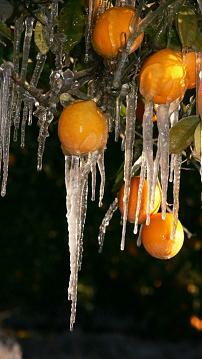 * In Florida there is a state of emergency as crops are threatened by bitter cold. Enjoy that fresh squeezed orange juice you have right now ­ this year orange juice might be worth more than gold. Weight limits for big farm trucks are being lifted to permit as much of the orange and grapefruit crops to be harvested as possible. You might want to stock up your freezer with frozen juice as an alternative. You can sell it to your neighbors later at a hefty profit! * St. Louis, Missouri may see temperatures fall below zero for the first time since 1999. * Little Rock could see temperatures of +10F with a wind-chill of -20F four days from now according to the National Weather Service. * Thursday and Friday will get hot in Dallas – as temperatures reach a balmy high of +20F. National Weather service has said that consecutive days of cold in Dallas like this haven’t happened since 1998. * Northern plains will see wind-chills of -20F to -30F. * Atlantic, Iowa broke a 1958 record when temperatures dropped to ­ 29F. * Kansas City, MO already dropped to +1F and froze a homeless man to death. * A dusting of snow is expected in Atlanta, GA.
* There have been four cold-related deaths in Tennessee. “Some hard freeze warnings were also in effect in Louisiana and parts of the state could see temperatures drop into the 20s, some of the coldest weather in the area since 1996, CNN affiliate WWL in New Orleans, Louisiana, reported. Supplies for protecting pipes from freezing were disappearing from area stores, CNN affiliate WDSU reported. It forced some to discuss other options — like wrapping pipes in newspaper and covering it in plastic, WDSU reported. Clearly just about every state has been hammered by unexpected cold weather. And there are many more problems from the cold across the country which I won’t include here. More info can be found at CNN  but hang around and read the rest of this first. 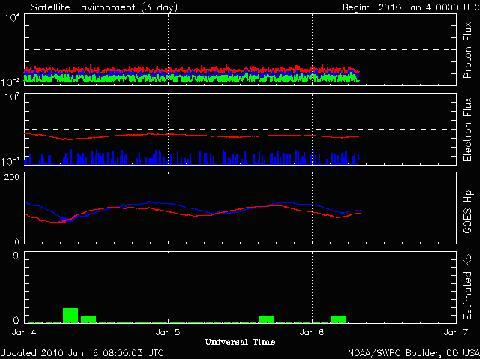 Solar activity has been incredibly quiet. I have been watching NASA’s charts daily since the late 90’s. Below are three charts which show a marked decrease in solar activty. Some scientists have linked solar activity with weather changes. Charts below were slightly reduced to fit the page, but NASA graphics produced some resolution issues. Charts Fig. 1 through Fig. 3 are completely unedited other than for size reduction. Electron flux is a scientific term which refers to electrons given off by the Sun. Vertical green bars at the bottom are an indication of geomagnetic activity collected by a network of monitoring stations. During normal solar activity with a few sunspots, these bars often extend half-way or most of the way up the chart. When this happens, the Aurora can be seen on a clear night further south than normal. For many weeks these green bars have been down near the bottom or not even visible at all. There is little doubt that record cold has hit for the Winter 2009/2010. Last Winter people were skating in fountains at Trafalgar Square in London, and skiing on streets. Much of Europe was crippled by record cold temperatures and snow. Solar activity has also been declining for many months, and last Summer was also cooler than usual.